The menisci of the knee are two C-shaped wedges of elastic cartilage that sit in the knee in between the bones, acting as load bearers and shock absorbers. Meniscal tears are very common, and if a meniscal tear is causing significant enough symptoms then it is likely to need proper treatment with a knee arthroscopy. Most meniscal tears are not actually repairable. However, some are. The likelihood of your surgeon being able to perform a meniscal repair will depend on many factors, including your age, how long the tear has been present, the specific type of tear, the general condition of the meniscus and the level of confidence and familiarity that your surgeon might have with the specialised techniques for meniscal repair. If a meniscal tear is not repairable and if the symptoms are bad enough to justify a knee arthroscopy, then the only option is to trim the torn meniscal tissue smooth, which is called a partial meniscectomy. The more meniscal tissue is lost, the less of a shock absorber is left, and therefore the more wear and tear there will be in the knee and the bigger the long-term risk of arthritis in the joint. If the torn meniscal tissue is ragged and/or degenerate the damage will already have been done, and the meniscal tissue will already have lost its function, and therefore trimming the torn tissue will relieve the symptoms but won’t cause any additional damage. If the meniscal tissue is still actually functional despite a meniscal tear, then these are the exact type of meniscal tear that can and should be repaired rather than trimmed. 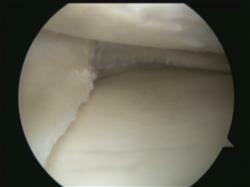 Unfortunately, most meniscal tears tend not to be repairable, with only about 25% being suitable for meniscal repair. Trimming a meniscus is called ‘partial meniscectomy’. Fortunately, nowadays it is fairly rare for an entire meniscal cartilage to need to be removed (total meniscectomy). One cannot accurately predict potential repairability of a meniscal tear from an MRI scan. However, one can often make a pretty good guess. 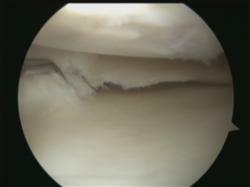 It is, however, only ever at the time of an actual arthroscopy (when one can carefully inspect and probe the meniscal tear) that one really discovers whether or not a meniscal tear is repairable. If a meniscal tear is not repairable then the torn tissue is trimmed back, so as to leave a smooth stable surface, taking away the minimum possible amount of meniscal tissue. The more meniscal tissue is lost, the less of a shock absorber will be left in that side of the knee, and therefore the greater the forces will be on the articular cartilage surfaces either side of the joint. This increases the potential rate of wear and tear, thus increasing the risk of the articular cartilage wearing away to leave exposed bare bone in the joint, which is ‘arthritis’. As a rough guide, if the whole meniscus is removed there will be a 15 times increased risk of arthritis developing in that side of the knee by a point 20 years later. However, this increased risk is proportional to the amount of meniscal tissue lost, so the smaller the partial meniscectomy the less severe the long-term consequences are likely to be. Furthermore, just because the risk of arthritis might be increased, this does not mean that the patient definitely will develop arthritis. This is why we do not automatically proceed with meniscal replacement surgery (meniscal scaffolds or meniscal allograft transplantation) directly after a partial meniscectomy – and we only contemplate meniscal replacement surgery (which is a bigger, more complicated, more difficult operation requiring long careful rehab) at a later date if the patient does actually go on to develop increasing symptoms and signs of wear and tear in the knee.